The Truman State University Board of Governors met in Kirksville, April 14, at its regular April meeting. Among the action items it considered were the approval of proposed renovations to Blanton/Nason/Brewer (B-N-B), the refurbishment and replacement of the seating and flooring in Baldwin Hall Auditorium, and the renovation of a building for the Regional Professional Development Center. The former project is part of the University’s on-going, $91 million effort to renovate on-campus student housing and the Student Union Building. The B-N-B project will commence this summer and will be concluded in time for the fall 2008 semester. The latter two projects are slated to be completed for the fall 2007 semester. The total value of these three renovation projects is estimated at $7.97 million. The Board also approved upgrading an existing exercise science pattern in athletic training to a freestanding Bachelor of Science athletic training degree program. A new undergraduate Bachelor of Arts program in Romance language was also approved by the Board, building on Truman’s strong existing foreign language programs. Both programs will be operated with existing resources and will now be submitted to the Missouri Coordinating Board of Higher Education for final approval. In other business, the Board of Governors approved a modest increase in enrollment fees for the 2007-2008 academic year. Tuition and fees for full-time, in-state undergraduate students will be $6,210, a 3.9 percent increase. Out-of-state fees for full-time undergraduate students will be $10,820, a 4 percent increase. The additional funds will be used to meet mandatory cost increases such as utilities and increased minimum wages as well as qualitative improvements in instructional equipment and campus technology. Based on a referendum vote by the student body, the Board also approved a $50 per semester-designated fee to support athletic facilities and programs. The fee was supported by 54 percent of the voters and will be used to improve athletics facilities used by all students and help maintain Truman’s varsity sports programs. 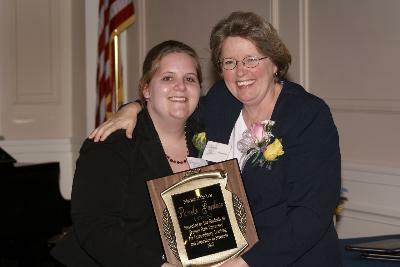 Pamela Gardner, assistant professor of nursing, (right) receives the Educator of the Year award from Becky Hadley (left) at the banquet April 10. Pamela Gardner, assistant professor of nursing, was announced as the 2007 Educator of the Year at the 18th annual banquet April 10. Gardner began her career at Truman in 2000. She received her B.S.N. from Fitchburg State College and her M.S.N. from the University of Missouri-Columbia. Her primary areas of expertise are child-family and maternal-neonatal nursing. This year more than 120 students nominated a record-breaking 82 faculty members for the Educator of the Year award. The eight-member student committee first narrowed the group down to 12 semi-finalists and then to six finalists. Finally, after reviewing the written responses by the nominated faculty members, getting input from the students in their classes and observing the faculty members in their classrooms, the committee selected this year’s honoree. Missouri Gov. Matt Blunt proclaimed April 16-21 Graduate Education Week. To publicize it’s graduate programs, Truman’s graduate office will have an informational table from 11 a.m. to 2 p.m. April 17 and 18 in the Student Union Building. Graduate students and faculty will also be wearing identifying stickers throughout the week. The University’s graduate programs include accountancy, headed by Scott Fouch, professor of accounting; biology, headed by Scott Burt, associate professor of biology; communication disorders, headed by Janet Gooch, associate professor and director of communication disorders; English, headed by Alanna Preussner, professor of English; education, headed by Sam Minner, dean of education; and music, headed by Warren Gooch, professor of music. The purpose of Graduate Education Week is to foster a greater public understanding about the indispensable benefits that graduate and advanced study provide for Missouri. The Truman State University Concert Percussion Ensemble I and the Truman Wind Symphony will be spotlighted in the upcoming Kohlenberg Lyceum Series concert. 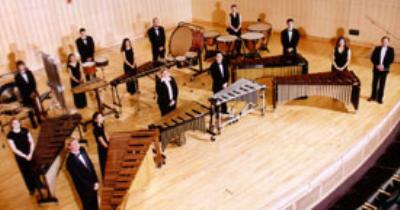 The concert will take place at 7:30 p.m. April 21 in Baldwin Auditorium. The Concert Percussion Ensemble I is under the direction of Michael Bump, associate professor of percussion studies at Truman. 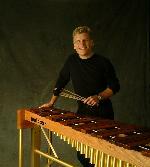 The concert will feature internationally renowned marimba virtuoso and composer, Michael Burritt. He is presently the director of percussion and chair of the instrumental area at Northwestern University in Evanston, Ill. Besides performing with the ensemble, Burritt will also be conducting master classes as well as private lessons for percussion students. 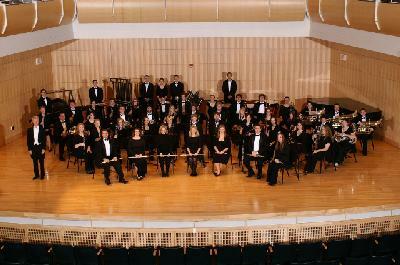 Truman Wind Symphony is directed by Dan Peterson, director of bands. The symphony will be performing three new musical selections including one composed by Frank Ticheli and one commissioned by Randy Smith, professor of saxophone. The final section will be a three movement work dedicated to the memory of one of Truman’s alumni, Raydell Bradley. This work was written for Bradley by one of his students who studied with him at Pacific Lutheran University. Contact Bump at 785.4052 or at mbump@truman.edu for more information about the performance and Burritt’s residency. Tickets for the performance are available. Tickets are free to all students, faculty and staff. Tickets for faculty and staff are available in the Center for Student Involvement, and students may pick their tickets up in the Student Activities Board office. 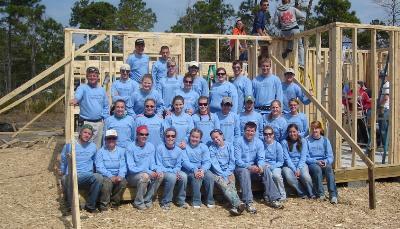 Members of Truman’s Habitat for Humanity chapter pose at the construction site of a home they are helping to build. The purpose of the week is to highlight the need to eliminate substandard housing and to create affordable housing opportunities. Truman’s Habitat chapter will be on the Quadrangle April 17-19 passing out statistics on poverty and selling T-shirts. The chapter will also be hosting Maria Pyra, a youth program consultant from Habitat for Humanity International. She will speak at 8 p.m. April 19 in Magruder Hall 1090. Pyra will be accompanied by Truman Habitat members who will be talking about their experiences volunteering in South Carolina during midterm break. The Truman chapter of Habitat for Humanity works with the local Kirksville chapter to build and refurbish housing for low income members of the community. The chapter is primarily concerned with increasing awareness about the needs of the community, fund raising, and providing free labor at the building projects. Contact Jessica Lufkin at jlufkin@truman.edu or visit http://habitat.truman.edu for more information. Hurst plans to promote healthier lifestyles through an education and exercise-based program focused on teaching group members the skills needed to empower lifetime health behavior change. All area Kirksville residents are invited to participate. The program is designed for those who are currently inactive and would like to make some changes. There are 50 spots available for this class. Cost is $50 for the entire nine-week session and includes the use of a pedometer during the time. Meetings will take place on Tuesdays and Thursdays June 5 through Aug. 9. Two class times are available, either noon-1 p.m. or 7-8 p.m. Participants with 80 percent attendance will get to keep their pedometer at the end of the session. Contact Hurst at 785.4464 or at jhurst@truman.edu for more information or to sign up. Blue Key National Honor Fraternity and Cardinal Key are hosting a weeklong campaign recognizing U.S. troops deployed overseas, April 15-21. The campaign is titled “Rockin’ For Our Troops.” The two organizations will be collecting care package donations, monetary donations and letters from Truman students and the Kirksville community. Throughout the week there will be bins and tables set up across campus for donations. The campaign culminates at the Matt Wertz concert hosted by the Student Activities Board at 8 p.m. April 20 on the Quadrangle. In conjunction with the concert, students and community members will be able to drop off donations at this event as well as record video messages for soldiers. SAB's Final Blowout from 2-6 p.m. April 21 on the Quadrangle will be the last opportunity to make donations. Contact Dustin Carmack at 660.216.8390 or at djc225@truman.edu for more information. Pickler Memorial Library has been chosen to participate in a pilot project designed to provide online access to technical and scientific reports from the National Technical Information Service (NTIS), the federal government’s central source for the sale of scientific, technical, engineering, and related business information by or for the U.S. government. This project will give the Truman community free access to more than 240,000 reports published between 1964 and 2000. Major areas of content include physics, environmental pollution and control, nuclear science and technology, medicine and biology, energy, chemistry, materials science, natural resources and earth sciences, computers and information theory, and behavior and society. Pickler Memorial Library is a member of the Federal Depository Program which is partnering with NTIS to provide these documents. Currently this database may be accessed only in the library. A librarian at the reference desk will be able to log people in. Keynote Panel: Michel Goldschmidt, Ronn Phillips and Rachel Katz BH 176 (Little Theatre) Reception to follow. The Office of Interdisciplinary Studies, ECO and the Division of Language and Literature will sponsor this event. The Division of Science will sponsor the conference. Dagget, the American region director of corporate affairs with Intel Corporation, will give two lectures on campus April 17. Joyce Gentry-Furrer (’79) and Jim Bergman, (’90), will be sharing their experiences in the workforce and discussing how Truman prepared them for their careers. He will speak about the Missouri Sunshine Law and discuss the ins and outs of open meetings and records law. The Missouri Attorney General’s Office and the Truman chapter of the Society of Professional Journalists will present this information. Shuttles will be provided to and from the observatory, leaving from the parking lot between Magruder and Violette Halls. Visit http://observatory.truman.edu for directions. Contact Matthew Beaky at beaky@truman.edu or at 785.4594 for more information. Join Pickler Memorial Library in Celebrating National Library Week (April 15-21) by reading an excerpt aloud from your favorite written work. Participants will read in 10-minute intervals during a six hour period. Stop by the Quadrangle in front of the Library to read and listen. There will be refreshments too. Students are invited to enjoy the free festivities, including food, T-shirts, inflatables, game booths, music, $1,500 in prizes and more. Contact Erica Foster at http://sab.truman.edu or at 785.4722 for more information. Student Senate will be awarding two $500 Northeast Missouri scholarships to two freshmen students at Truman who exemplify leadership and excellence. Students must be nominated by faculty or staff members in order to be considered for the award. Faculty and staff may nominate a student at http://senate.truman.edu for this prestigious award. Nominations are due by 5 p.m. April 19. Note, students nominated for this Northeast Missouri award must be from Adair and contiguous counties. Please contact Rebecca Hadley at behad@truman.edu with any questions. Make sure to nominate an outstanding freshman student today. Mehmet I. Goksu, assistant professor of physics, recently published his article, “Edge Magnetoplasmons in a Partially Screened Two-Dimensional Electron Gas on a Helium Surface,” in Physical Review B 75, 115323 (2007). Jim Turner, associate professor of business administration, attended the “Climate Change & Energy Policy Forum” April 4-5 at the Missouri Botanical Garden in St. Louis. About 200 representatives from Missouri businesses, utilities and academia attended. The Society for Sino-American Studies is hosting Cranes on the Quadrangle from 10 a.m.-2:30 p.m. April 17-19 on the Quadrangle in front of Pickler Memorial Library. There will be a bake sale fund-raiser for Operation Smile, a worldwide nonprofit organization that repairs facial deformities of children of low socio-economic status. Stop by the table decorated with cranes to donate to a worthy cause and get a sweet. Contact Helen Pham at 785.5780 or at hkp587@truman.edu for more information. Delta Sigma Theta is sponsoring the Sue Shear Dress Suit Drive from noon-3 p.m. April 17-20 in the Student Union Building. Delta Sigma Theta, the Society of the Prim Roses and the Women’s Resource Center will be collecting old and new business apparel. All donations will be taken to the local Salvation Army. Contact Danielle Leveston at dml801@truman.edu for more information. The annual Spring Canned Food Drive is here. Delta Sigma Theta will have a table set up from noon-3 p.m. April 17-20 in the Student Union Building. Donate canned food and other nonperishable items. All donations will be given to the local Salvation Army. Contact Krystal Fox at klf737@truman.edu for more information. The Commission on Undergraduate Curriculum invites faculty, staff and students to attend the remaining Open Forum titled “Beyond JINS: Interdisciplinarity in the New Curriculum.” The session will be from 3-4:30 p.m. April 17 in Magruder Hall 1096. The Muslim Students Association presents “Islam After 9/11: The Moderate Majority Speaks” from 6-7 p.m. April 17 in the West Campus Suites Multipurpose Room. There will be a panel discussion including a film clip and a question and answer session to follow. Everyone is welcome. Contact Andrea Cluck at aec600@truman.edu for more information. The Weekly Lunch Series will continue from 12:30-1:30 p.m. April 18 in the Student Union Building Alumni Room. It will feature reports from 2006-2007 Diversity Fellows, Civic Engagement Fellows and Scholarship of Teaching and Learning (SoTL) Fellows. Students Together Educating Peers hosts the True Man of Strength Awards at 6:30 p.m. April 18 in the Student Union Building Conference Room. The five nominated finalists will read their essays and the winner will be announced. The event is part of Sexual Assault Awareness Month. Contact Joe Hamilton at hamilton@truman.edu or at 785.4014 for more information. There will be a Homecoming Organization Chair meeting from 10-10:45 p.m. April 18 in Violette Hall 1000. Representatives from all organizations are invited to discuss the theme, events and points schedule for those organizations interested in competing. Contact Brandt Bell at bdb123@truman.edu for more information. I Got the Job! Delta Sigma Theta is sponsoring an interview workshop from 6-7 p.m. April 19 in the Career Center. Learn how to have a successful interview in applying for a new job or professional and graduate schools. Contact Danielle Leveston at dml801@truman.edu for more information. There will be a Better World Books recruitment meeting from 8:30-10 p.m. April 19 in Baldwin Hall 249. Better World Books is an organization that has a book drive at the end of each semester for those in impoverished areas of the world, such as Africa. The organization is actively looking for volunteers to help collect and ship books. Contact Katie Palazzolo at kap529@truman.edu or at 314.882.7392 for more information. Alpha Phi Omega is hosting, St. Baldrick’s, a fund-raiser for childhood cancer research, at 1 p.m. April 21 in the Centennial Hall Main Lounge. Members of the Truman community will shave their heads to support kids with cancer and enjoy barbecue, dancing and prizes. Contact Christy Yoder at cey148@truman.edu for more information. Psychology capstones will be presented from 1-4 p.m. April 23 in the Student Union Building Activities Room. People may stop by the Student Union Building to see psychology majors’ poster presentations. Contact Karen Smith at ksmith@truman.edu or at 785.6033 for more information. University Counseling Services (UCS) is sponsoring a Cancer Support Group for students struggling with cancer and those who have friends or family members with cancer. The next meeting will be at 6:30 p.m. April 23 in Pershing Building 234. Contact UCS at 785.4014 or visit http://ucs.truman.edu for more information.